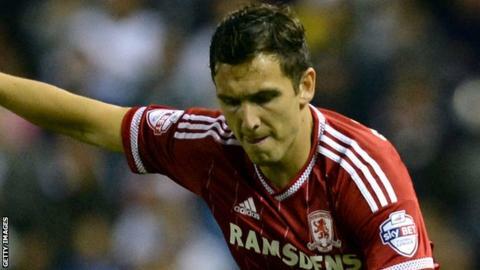 Stewart Downing re-joined his hometown club this summer for £5.5m from West Ham. Middlesbrough winger Stewart Downing says the chance to win promotion for his hometown club was more of an incentive than staying in the Premier League with West Ham United. The 31-year-old swapped the Hammers, who finished 12th in last season's top flight, for the chance to take the Teessiders up from the Championship. He cost Boro £5.5m, despite West Ham boss Slaven Bilic wanting him to stay. "I really wanted something to play for," Downing told BBC Tees. "At West Ham where could we realistically finish? Ninth or 10th? Even last season we did well but finished 12th. "It's a good challenge for me [at Boro]. It's a big thing to play for promotion at the end of the season and it would be a massive achievement." Bilic's disappointment at losing the England international was made public in press conference comments made earlier this summer - but Downing had his own plans. "It's difficult for Slaven, in his first week of the job, but he didn't convince me enough to stay," continued the Middlesbrough-born forward. "That was one thing - the other was I was playing 10 in a free role last season and I really enjoyed it, but he didn't really give me a guarantee and he had players coming in like Dimitri Payet, who was his first-choice number 10. "When I spoke to the chairman [Steve Gibson] and Aitor [Karanka] here, who had good plans and wanted me to be big part of that, it was an easy decision to make."